Description Train your own amiboo! Share it with your friends! In this new update, there's a brand new stage, more bug fixes, a temporary music for the stage, and also a much better-looking menu! Expect a new challenger coming to v3.0! And, of course, anything that you guys suggest me on Miiverse. I hope you enjoy Amiboo Training Simulator. Instructions Press A to train a brand new amiboo, or press B to fight one of your previously saved amiboo. Use the circle pad to choose your fighter and your amiboo. Press L+R to begin! Make sure to train your amiboo efficiently! It will take a while, but eventually it might surprise you! While on the End screen, press A to fight again, press B to go back to the main menu or press X to save your amiboo. Notes Version 1.0: KRNX52KE Initial Release. 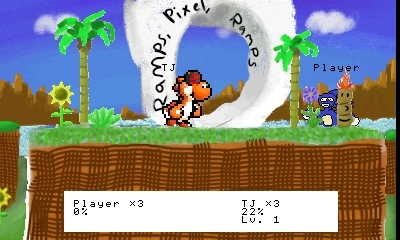 Version 1.5: A584528E *You can now load amiboo Version 2.0: EXCV833J *TJ "Henry" Yoshi joins the battle *New character selection screen *Amiboo now have levels of experience, from 1 to 100 *Improved attacks and physics *Added voice acting Version 2.5: PE33D2AE (latest version) *New stage, removed the old one *Added temporary stage music *Improved the menu and character selection *Fixed more bugs and problems *Added credits to bottom screen For suggestions, bug reports, questions, business inquiries, etc: contact me on Miiverse (or here)! I'd love to know what you think of my game! Thanks for playing! Credits: Trinitro21 and Perska for importing several essential files. 12Me21 for the WAV player. Lumage for that awesome Sanic stage. what is this, miiverse? IAmRalsei Forum Leader Hidden Achievements First Year My account is over 1 year old Website Expert Programmer Programming no longer gives me any trouble. Come to me for help, if you like! Programming Strength Edited 1 year ago Show 12me21 Yeah! [/12me21] [12me21]Yeah! [/12me21] [12me21]Yeah! (i put spoiler here but it disappeared) CoinzReturns 3 years ago I haven't tried this yet. But I think I'll wait till it's further in development. Guzzler First Week Joined in the very first week of SmileBASIC Source Website Drawing I like to draw! Hobbies Intermediate Programmer I can make programs, but I still have trouble here and there. Programming Strength 3 years ago You need to implement a move where TJ "Henry" Yoshi uses a half A press(or something like that). Yttria Head Admin 3 years ago or just somesuch easter egg if A is held and/or released (but not in the press-start state) when the program starts Guzzler First Week Joined in the very first week of SmileBASIC Source Website Drawing I like to draw! Hobbies Intermediate Programmer I can make programs, but I still have trouble here and there. Programming Strength 3 years ago Perhaps. 12Me21 Syntax Highlighter Received for creating the code syntax highlighter on SBS Night Person I like the quiet night and sleep late. Express Yourself 3 years ago that's a good idea IF ! (BUTTON(2)AND #A)&&(BUTTON(0) AND #A) THEN ... at the start PesticidePoison Good Page Hidden Achievements Spring 2017 Contest Runner Up I placed 2nd in the SmileBASIC Source Spring 2017 Contest! Programming Contest Second Year My account is over 2 years old Website Edited 3 years ago I named one of my goats mayro, that's how much I need him. (no really I did) PesticidePoison Good Page Hidden Achievements Spring 2017 Contest Runner Up I placed 2nd in the SmileBASIC Source Spring 2017 Contest! Programming Contest Second Year My account is over 2 years old Website 3 years ago Sanic needs his rival: Mayro #MakeMayroHappen ElzoBro First Day Joined on the very first day of SmileBASIC Source Website Video Games I like to play video games! Hobbies Drawing I like to draw! Hobbies 3 years ago this Sam Amazing Page Hidden Achievements Great Page Hidden Achievements Good Page Hidden Achievements 3 years ago But wait, I can do better. I can do it in half an A press. ColeslawProductions 3 years ago Malleo's a thing ColeslawProductions 3 years ago have malleo and maryo Flashlight 3 years ago IS THAT GRAND DAD ColeslawProductions 3 years ago YEP Flashlight 3 years ago FLEENSHTONEZ?!?!? ElzoBro First Day Joined on the very first day of SmileBASIC Source Website Video Games I like to play video games! Hobbies Drawing I like to draw! Hobbies 3 years ago OMG I GET THE TJ HENRY YOSHI JOKE NOW! ThatStupidGuy 3 years ago You gonna need help with anything? Call me up. Sam Amazing Page Hidden Achievements Great Page Hidden Achievements Good Page Hidden Achievements 3 years ago 2.5 is out! 12Me21 Syntax Highlighter Received for creating the code syntax highlighter on SBS Night Person I like the quiet night and sleep late. Express Yourself Edited 3 years ago a version is a version, you can't say it's only a half! A2D_apps Minecraft Is Awesome! I love Minecraft! Express Yourself Zelda Is Awesome! I love The Legend Of Zelda! Express Yourself Pokemon Is Awesome! I love Pokemon! Express Yourself 3 years ago actually its not half a version. its called a build on the version. adding a little to it. a small update TheV360 Pokemon Is Awesome! I love Pokemon! Express Yourself First Day Joined on the very first day of SmileBASIC Source Website Night Person I like the quiet night and sleep late. Express Yourself 3 years ago A2D, it was a joke. A2D_apps Minecraft Is Awesome! I love Minecraft! Express Yourself Zelda Is Awesome! I love The Legend Of Zelda! Express Yourself Pokemon Is Awesome! I love Pokemon! Express Yourself 3 years ago okay geez 12Me21 Syntax Highlighter Received for creating the code syntax highlighter on SBS Night Person I like the quiet night and sleep late. Express Yourself 3 years ago Well, A2D "Henry" Apps... A2D_apps Minecraft Is Awesome! I love Minecraft! Express Yourself Zelda Is Awesome! I love The Legend Of Zelda! Express Yourself Pokemon Is Awesome! I love Pokemon! Express Yourself 3 years ago Henry??? Thats not my name... Sam Amazing Page Hidden Achievements Great Page Hidden Achievements Good Page Hidden Achievements 3 years ago It isn't TJ Yoshi's either. 12Me21 Syntax Highlighter Received for creating the code syntax highlighter on SBS Night Person I like the quiet night and sleep late. Express Yourself 3 years ago It's too hard to knock your opponent off the screen. They seem to only die when they walk off the edge automatically. ElzoBro First Day Joined on the very first day of SmileBASIC Source Website Video Games I like to play video games! Hobbies Drawing I like to draw! Hobbies 3 years ago This page is like, wrongfully downvote bombed for no reason. Apparently it just doesn't look good enough for some people. How rude. UltraPhoenix4 Third Year My account is over 3 years old Website Bees Hidden Easter Eggs Avatar Taboo I didn't change my avatar for 180 days Website 3 years ago There are only 1 or 2 downvotes though. Sam Amazing Page Hidden Achievements Great Page Hidden Achievements Good Page Hidden Achievements 3 years ago Right now, the page has 11 upvotes and 1 downvote. I don't see what you're talking about, Elzo. Yttria Head Admin Edited 3 years ago It's fine to downvote things anyway. What's the point in having a system for judging quality if people aren't willing to share their opinion? Sure it's rude to say you don't like something for the heck of it, but it's not "rude" when there's actually something to dislike. Is this bad? No. Does it deserve a higher rating than Spooky Maze? Probably not. ElzoBro First Day Joined on the very first day of SmileBASIC Source Website Video Games I like to play video games! Hobbies Drawing I like to draw! Hobbies 3 years ago It's appearing grey for me, I need to update my browser... TheV360 Pokemon Is Awesome! I love Pokemon! Express Yourself First Day Joined on the very first day of SmileBASIC Source Website Night Person I like the quiet night and sleep late. Express Yourself 3 years ago an a press is an a press you cant just call it a half Unclesporky 3 years ago https://www.youtube.com/watch?v=kpk2tdsPh0A UltraPhoenix4 Third Year My account is over 3 years old Website Bees Hidden Easter Eggs Avatar Taboo I didn't change my avatar for 180 days Website 3 years ago https://youtu.be/kpk2tdsPh0A?t=1m7s Sam Amazing Page Hidden Achievements Great Page Hidden Achievements Good Page Hidden Achievements 3 years ago 2.0 is out! Sam Amazing Page Hidden Achievements Great Page Hidden Achievements Good Page Hidden Achievements 3 years ago 1.5 is out! ElzoBro First Day Joined on the very first day of SmileBASIC Source Website Video Games I like to play video games! Hobbies Drawing I like to draw! Hobbies 3 years ago Why is it being downvoted it's early alpha right?